The Greatest Road Trip Ever Taken returns to the open road with a trip to and through beautiful Idaho, and an open road it is indeed. Idaho is the 14th largest state in the Union but with the 11th fewest people. It joins rural brothers Alaska, Montana, and Wyoming as states out west still adhering to a pioneer identity. Idaho’s license plate says “Famous Potatoes.” Let it be known that the finest russets, bakers, and embryonic mashed potatoes come from Idaho. The residents of Idaho are, frankly a little tired of the moniker, so let’s be done with that. Pioneer identity in Idaho goes beyond the small people/acreage statistic. Idahoans are a hardy lot. They are independent thinkers who, mostly, want to be left alone to think their thoughts. The Marlboro man was born in Oklahoma and raised in California, but he would have been right at home in central Idaho. Idaho achieved Statehood in 1890, but there is so much more to that story than just a date. There was the chaotic transfer of the territorial capital from Lewiston to Boise. Then the disenfranchisement of Mormon polygamists, a decision that was upheld in 1877 by the U.S. Supreme Court. Finally, there was an attempt to split the territory in half between Washington Territory, and the state of Nevada. Suffice it to say, Idahoans worked hard for their state.The highest point in Idaho is atop 12,662 foot Borah Peak in east-central Idaho. The lowest point is 713 feet above sea level at the confluence of the Snake and Clearwater Rivers. The geographic center of Idaho is found in the ghost town of Custer, located in Custer County. Boise is the state capital. It is also the only Idaho city with a population exceeding 100,000. Time zones are a tricky subject in Idaho. The northern part, from the panhandle south to White Bird is Pacific Time. The mid and southern part of Idaho is Mountain Time. Roughly 74% of Idaho’s population are Mountain Time Zone, but several of its popular recreational locales are Pacific Time. It can be confusing. Idaho Falls Regional serves almost 150,000 passengers a year. Salt Lake City is the most frequent destination. Boise Airport enplanes about 1.3 million flyers annually. Seattle is the most common destination. Military/Politics: Sen. Frank Church and Sarah Palin. Actors: Lana Turner, Scout LaRue Willis, Aaron Paul, Zach Shada, Christian Jacobs, Claire Blackwelder, Johnny Sequoya, Aidan Alexander, and Jeremy Shada. Entertainers: Jake Pitts, Victor Wooten, Jason Gray, Elena Coats, and Jeremy Warner. Writers: Ezra Pound, Carol R. Brink, and Vardis Fisher. Athletes: Picabo Street, Torrie Wilson, Harmon Killebrew, and Taysom Hill. The Cataldo Mission is the oldest building in the state. It is located about 20 miles east of Coeur d’Alene in Idaho’s panhandle. Idaho law forbids anyone to give an Idaho citizen a box of candy that weighs more than 50 pounds. The Appaloosa was first bred in Idaho’s Kamiah Valley, primarily as a warhorse. Hell’s Canyon, at 7,900 feet, is the deepest gorge in North America. Weiser is home to the National Old Time Fiddlers Contest. Sightseers at Heaven’s Gate Lookout on Seven Devils Peak can look into four states. Wake up, Slumberface! Idaho is a big state, and we have miles to drive. Let’s start in Sandpoint and end in Preston…for reasons that will soon come clear. We fall in love with places for any number of reasons. Sometimes, we like the skyline, or maybe we like the forest environs. Sometimes, the people themselves make you fall for their town. There are two towns in the west that simply must be entered from the right direction, and it is at the entrance that we will fall in love. One of those places is San Francisco. I don’t care how many miles out of the way it takes. First-timers must enter via the Golden Gate. First-time visitors to Sandpoint, Idaho must enter from the south. The crossing of Lake Pend Oreille is a beautiful and majestic introduction to Sandpoint. The Golden Gate raises us high above the waters of San Francisco Bay. Idaho’s Hwy. 95 across Lake Pend Oreille (pronounced Pon-der-ay) takes us across the blue water at near water top depth. What a start to our trip! We’re going to begin atop Schweitzer Mountain. Visiting Schweitzer is a no-brainer if you love to ski. The fast lifts and well-groomed trails make it a must ski resort. It is cheaper and less crowded than its sister ski areas in the west. If you don’t ski or are visiting in the summer Schweitzer is still a no-brainer. We can ride the chairlift to the top and hike back down. The fresh air is invigorating, and the appetite we raised can be satisfied at Schweitzer Mountain Lodge. Later tonight we will come back here and spend one night for $113. Next, we will go to Sandpoint City Beach. The big lake we crossed as we entered is bounded by miles of beach. Some of that beach is in the middle of downtown. Warm, clean sand, playgrounds and a snack shack line the clear blue water. Sandpoint is a town for all seasons. We’re tired after a day on the mountain and the beach. We will sleep well. Up and at em’ the next morning. First stop, Coeur d’ Alene. Let me give you a hand here. The locals will snicker into their hands (or maybe they won’t hide it at all) if you get it wrong. It’s “Core-Duh-Lane”. Translated “Heart of the Awl” it comes from the French trappers who were among the first visitors to this part of the world. A trip to Coeur d’Alene must include two stops. First, breakfast at Michael D’s Eatery. Their custard french toast is an amazement for miles around. 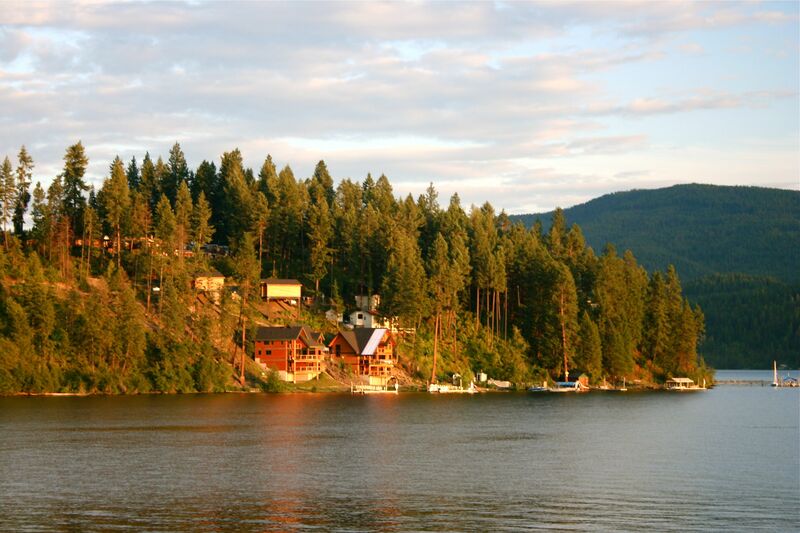 Second, Coeur d’ Alene Lake boasts some of the finest scenery in all the land. Idahoans love Coeur d’Alene to the point that they name everything in the area Coeur d’ Alene. Town (check), Lake (check), mountain (check), pets (likely check). We are back in the car for the trip through Nez Perce Historical Park on our way to Grangeville. We will spend two nights at the Gateway Inn for $80 a night because we have a big day planned tomorrow. After our second night in Grangeville, we’re ready for the bright lights of the big city. Boise is the closest thing to a big city we’re going to find in this state. Boise has a younger vibe than the smaller towns that surround it, probably because of the presence of Boise State University. In a state filled with nature’s bounty, we will find plenty in Boise. Then, we will see some blue grass…as opposed to bluegrass. The Boise River Greenbelt is our first destination, and where we will rent some bikes. Sure, we could walk a part of the greenbelt and be very happy we did, but biking the full 22 miles around is the way to go. Pristine greenways, wildlife (of the small variety), and blue water remind us why people choose to live out west. It’s all here, almost within sight of the center of state government. We already mentioned Boise State University. The campus itself isn’t unique enough for a tour, but visitors to the city need to check out the Bronco’s blue football field. No, it isn’t “tinged” blue. It’s a vivid blue that Honda would be proud to use as paint on their Accord. It is one of a kind. You decide whether it is the coolest grass you’ve ever seen or a migraine-inducing eyesore. It will certainly be one or the other. I’m proud of you for finishing the long bike ride without complaint. Are you hungry? I thought you were. Your accomplishment shall be rewarded at Chandler Steakhouse. You can have anything that strikes your fancy, but I recommend Beef Carpaccio with a chocolate soufflé for dessert. Later, we’re staying at Inn America for just $66 a night. The next day we’re off to Sun Valley. Less than three hours from Boise, Sun Valley has been America’s original mountain destination since 1936. It was North America’s first ski resort, bringing the joy of a Euro-mountain experience to folks on this side of the Atlantic Ocean. Sure, people ski some great powder here, but it’s a year-round vacation destination. Sun Valley attracts such a mix of movie stars and Olympians that we are almost bound to see someone we recognize. During the summer months, Sun Valley offers mountain biking, horseback riding, ice skating, golf, and hiking. Add fine dining, spectacular ice shows, and special events. It may be your best vacation ever, but it’s just a part of this one.We’re staying one night at Sun Valley Lodge for $261. For our last day in Idaho, we have two things to do. We’re going to see Niagara Falls, and we will finish in a town made into a legend by a movie. Well, it isn’t exactly Niagara, but it is Idaho’s version. Shoshone Falls is a pretty sight year-round. From April through late August it is a magnificent spectacle, as the water cascades to the floor of the park with the thunder of a million hooves. Close your eyes and imagine the wild horses that used to call this area home. We will spend a couple of hours here, enjoying a picnic lunch. Six days and 1,040 miles from Sandpoint we arrive in Preston, Idaho. Until Napoleon Dynamite was born from the imagination of actor Jon Heder, Preston was unknown. Now, it’s a cult film lover’s Mecca. Napoleon lived with grandma, brother Kip, and llama Tina at 1447 East 800 North Rd. His high school is the actual Preston High, at 151 East 200 South. He played tetherball on the playground at 525 South 400 East Street. The wedding of Kip and LaFawnduh was held at Lamont Reservoir, a couple of miles east of Preston. Idaho is a unique and wonderful state, and Preston is the perfect ending point.